This week’s QUOTE FOR ANXIETY. 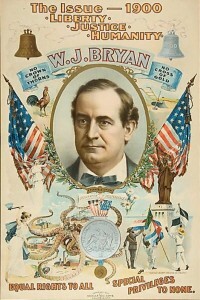 William Jennings Bryan, (1860 – 1925) practiced law in Jacksonville. In 1887 he moved to Nebraska where he hope to start a political career. He was elected as a Democrat to the Fifty-second and Fifty-third Congresses. He was unsuccessful in his bid to be the Democratic candidate for President in 1896. 1900 and 1908. He became Secretary of State in the Cabinet of President Wilson and served from March 4, 1913, until June 9, 1915, when he resigned. Much wisdom is to be gained from this quote by Bryan. You’re not going to get self-confidence if you wait passively for things to happen to you. You have to be proactive and facing your fears and achieving success can be a real confidence booster. It’s important to remember these achievements as ‘marker points’ on the journey of life. When you feel fearful or afraid, just remember all those things that you have successfully achieved and move forward in confidence. Previous Previous post: Keeping quiet!